Sales, construction and general contracting, this Great Mills, Maryland company is deeply rooted in its community, neighbors and customers. The company’s commitment to good neighbor principles enhances a high quality relationship in the community. Founded in 1970, the Trading Post originally bought and sold used furniture and later added used equipment and cars to the mix. 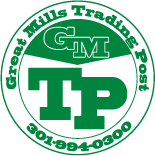 In 1987, the Trading Post merged with the Great Mills Construction Company, which has been a major provider of construction and equipment support services to state, local and federal governments for over 30 years. The Trading Post has performed construction contracts for the Navy for over 20 years and has expanded its business to the private commercial sector as well. Today, the company consists of about 100 employees. Twice a year one of the largest equipment auctions on the East Coast is conducted through the company owner and founder. Thu, 15 Sep 2016 - Cow Pie Bingo Is Back! Mon, 16 Sep 2013 - MetCom Finishes FDR from Library to Great Mills Rd. Mon, 8 Apr 2013 - Decades in Planning, Months in Making: FDR Blvd. Wed, 16 Nov 2011 - SOLD!